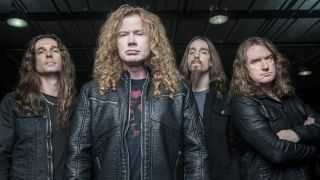 Megadeth’s David Ellfeson says it’s unlikely that the band’s new album will arrive this year. The bassist was speaking with Talking Rock With Meltdown when he made the comments, which came after Dave Mustaine told Music Radar last month that he had “about eight songs” ready for the follow-up to 2016’s Dystopia. Ellefson says: “We were obviously planning to do the Ozzy tour and now that's been pushed back until next year, it probably opens up a perfect window for us to really get in now. “All things happen for a reason, so I think on the Megadeth schedule, it’s probably good timing to just go right in. We're going to definitely be hunkering down now to get that going. “That’s because we have some of our own shows in August, and there's actually a few more coming in now – there's Rock In Rio, and that's early October and then there's the MegaCruise." Ellefson adds: "As much as we were hoping to have a record out this year, looking at how the Dystopia timeline was where we were working on it early in 2015, we started doing some shows later that year, we put out a heavy track Fatal Illusion and then the record dropped in early 2016. Last month, Megadeth released the compilation album Warheads On Foreheads to celebrate their 35th anniversary.